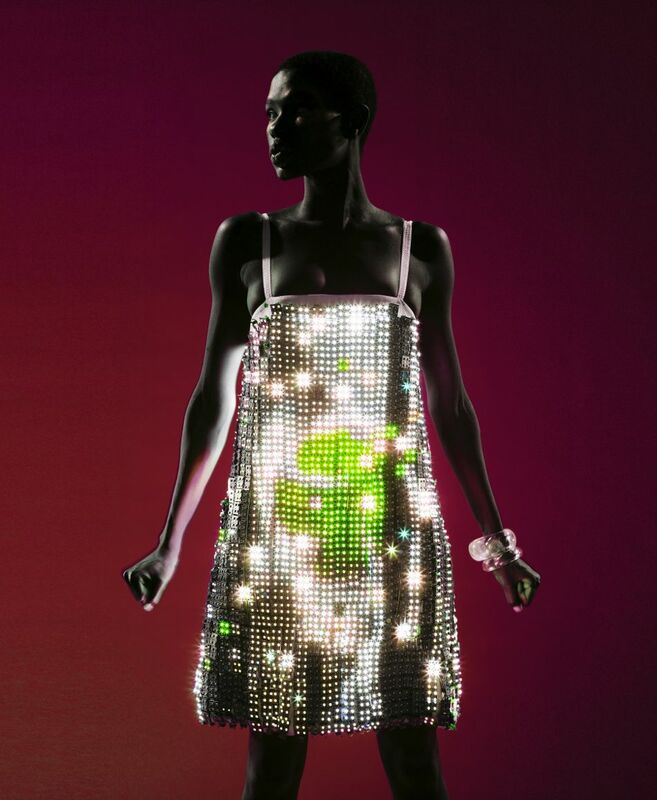 Furthering his technological trend, Chalayan unveiled the collection entitlledReadings, on screen, eshewing the conventional runway. 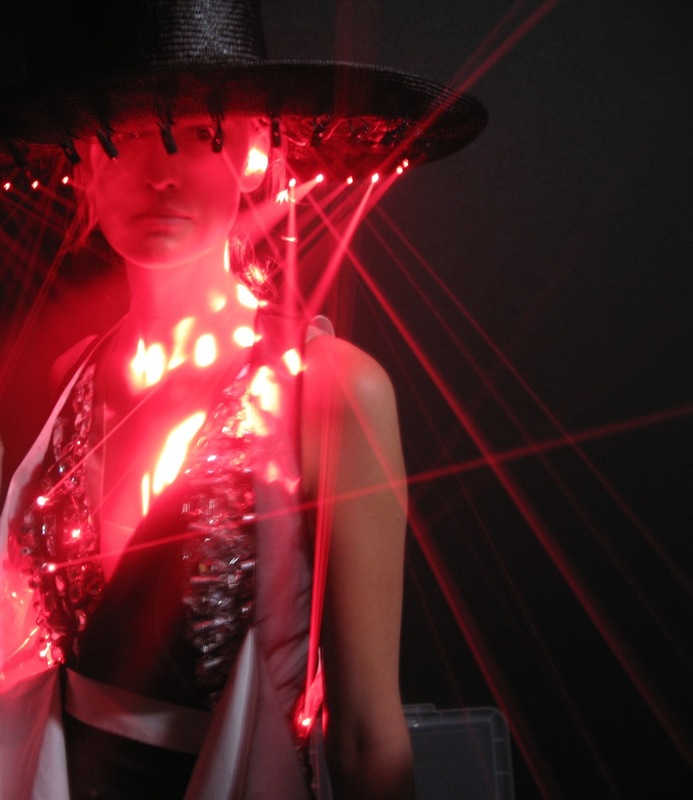 The dresses themselves are highly structured, creating bold silhouettes from which the laser beams radiate. They are embellished with Swarovski crystals that either deflect the lasers, or take in their light, depending on the angle of the laser. The effect is hauntingly beautiful; where lasers shine directly into Swarovski crystals, they resemble glowing embers, yet where they are deflected the laser beams project into the surrounding space, evoking phantasmagorical new-age sun gods. Twice named “British Designer of the Year”, Hussein Chalayan is an internationally regarded fashion designer renowned for his architectural tailoring and progressive use of new technology. His spring 2008 collection Readings was inspired by themes of ancient sun worship and the contemporary phenomenon of celebrity, illustrated by pieces that literally emanate light. The extending laser beams represent the relationship between audience and icon. Waldemeyer’s engineering genius made this challenging vision possible. Hundreds of lasers were integrated into each piece, attached by custom-designed, servo-driven brass hinges. 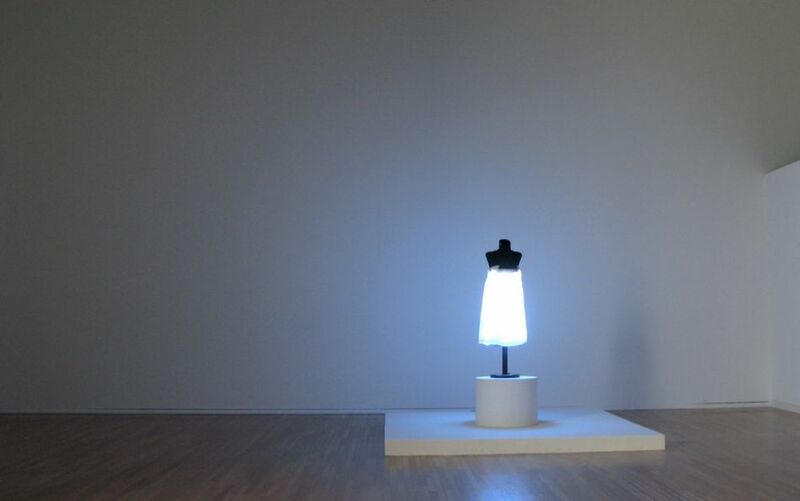 This allows the lasers to move, transforming the dresses from static objects to living, ephemeral forms that constantly change, interacting with the space around them. The result is one of the most dynamic examples of a new fusion, where fashion and design meet, each enhancing the other. 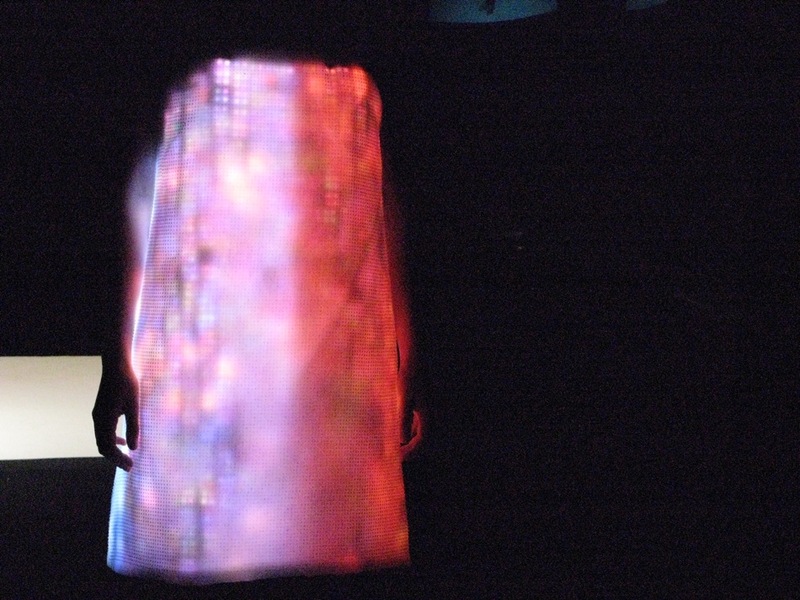 The Video dresses are created by 15000 LEDs embedded beneath the fabric. One dress displays hazy silhouettes of sharks in the sea whilst the other shows a time-lapse sequence of a rose blooming then retracting. The effect is mesmerizing in its ambiguity: the loose white fabric covering the LEDS blurs and distorts the images so that they seem to pulsate in and out of existence. Twice named “British Designer of the Year”, Hussein Chalayan is one of the most innovative, experimental and conceptual fashion designers of the present. By teaming up with engineering mastermind, Moritz Waldemeyer, he was able to turn even his most outlandish concepts into a reality. The design brief was to create two video dresses that would show video sequences across the entire surface of the dress. There were just 4 weeks from the go ahead to the show, demanding a very pragmatic approach: no exotic components or materials, just off the shelf components and standard manufacturing techniques. Given the inherent simplicity of the design, maybe one day in the not too distant future, we’ll all be wearing our favorite videos on our clothes! This entry was posted on Tuesday, February 27th, 2007 at 1:18 pm. It is filed under ALL PROJECTS, FASHION. You can follow any responses to this entry through the RSS 2.0 feed.